Last week, Barrier's President and CEO, Michael Huddy traveled to Alberta, Canada to meet with our Canadian wholesaler, Okaply, local code officials, members of the fire department, Structural Insulated Panel manufacturers, and residential building material suppliers. Starting May 1, 2009, Alberta's building and fire codes are changing, which is creating significant opportunity for products like Blazeguard Fire-Rated Sheathing. One change taking place is the requirement for implementing fire protection techniques and materials used during the construction phase to protect adjacent buildings from catching fire. Another viable market opportunity is for the interior wall of structural insulated panels. Mike Huddy and Clint Van Berkel of Okaply visted eGreen, a potential client who constructed a sample interior wall using Blazeguard. They were very pleased with the result. Clint Van Berkel with Okaply looking at a sample of Blazeguard Fire-Rated Sheathing. The white, Blazeguard face which was texturized and then painted. Barrier joined the Structural Insulated Panel Association (SIPA) last week in Chicago, participating as a Silver Level Sponsor of the SIPA Annual Meeting with it's theme, "We're On a Mission (to change the Way We Build)." Barrier's National Sales Manager, Jim Dukart, answering a potential customer question at the show. Barrier's mission within the SIP market is to become the preferred fire-retardant coating for panels used in SIP wall and roof construction worldwide. Blazeguard already has ICC approval (Section 4.2.d of our ICC ESR-1365) as a code-complaint 15-minute thermal barrier for use in inhabitable buildings using solid foam core insulation (Blazeguard has actually been tested to a 20-minute thermal barrier). 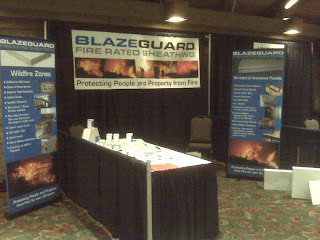 Blazeguard is already in use in several residential as well as non-residential SIP construction projects across the country, ranging from lake cabins in northern Minnesota to prison buildings in Ohio to fishing boat storage facilities in Alaska. Blazeguard is applied to traditional OSB (oriented strand board) SIP-skins and shipped to panel manufacturers for assembly into panels. 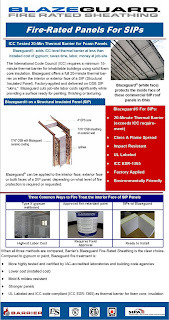 Builders using Blazeguard-coated panels already have a fire-retardant barrier in place - there is no longer any need to add Type X gypsum wallboard as a fire barrier on the interior face of a SIP panel, saving builders the time and trouble of hoisting, blocking, placing and taping multiple layers of gypsum to walls and ceilings. Barrier is also working on producing Class A and Class C rated SIP roof panels and on testing 1-hour-rated SIP firewalls. While traditional "stick-frame" wood construction has slumped dramatically in the past year, SIP construction has dipped only slightly. SIP construction, moreover, offers significant advantages over traditional stick-built structures, starting with improved energy efficiency, faster construction times and streamlined building design but also offering increased structural strength and better acoustics (filled wall cavities help to deaden sound transmission). Adding Blazeguard to a SIP panel only accentuates these SIP advantages, helping builders save time, reduce waste and create stronger, cleaner, "greener" buildings. Barrier's National Sales Manager, Jim Dukart, is heading out to the 2009 SIPA Annual Meeting being held in Chicago, April 20-23. If you're attending - stop by booth #14 in the Exhibit Hall. In preparation for the event, an email newsletter was sent out to all Barrier's Structural Insulated Panel contacts. Click here to view. fire rated sheathing, fire rated osb, fire rated plywood, multi family construction, commercial modular, structural insulated panels, otcbb, ibtgf, ibt, barrier, blazeguard, mycoguard, blazeguard fire rated paint, intumescent paint, mold resistant, noncombustible, ignition resistant, under eave application, wui listed, california state fire marshall approved, ignition resistant soffets, electrical panel backer board, non combustible exterior wall application, class a assembly, class c assembly, sips, esr 1365, icces, ignition resistant exterior wall sheathing.